Over the weekend, someone let me know they saw a western corn rootworm adult. Remember this pest overwinters as an egg that hatches in June! They get confused with closely-related species every spring: striped cucumber beetle. Striped and spotted cucumber beetles overwinter as adults and become active when spring temperatures warm up. 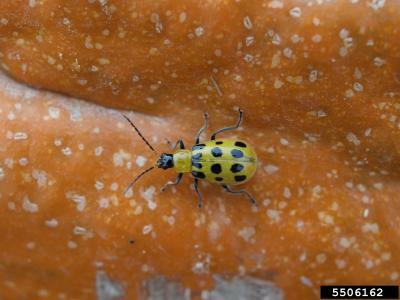 Most scouts are able to distinguish northern corn rootworm and southern corn rootworm (also known as spotted cucumber beetle) fairly easily. 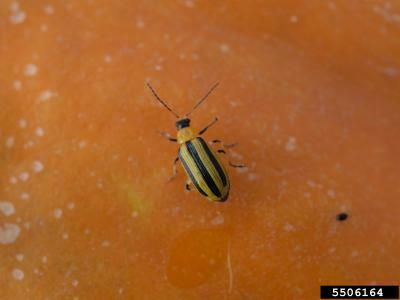 However, western corn rootworm and striped cucumber beetles can be distinguished by the stripes on the forewings. Western corn rootworms are yellow with a dark head. Females have three black lines on the forewings that do not extend to the wing tip. The forewings of males often look like a black smudge (note one male in this photo). Photo by Purdue Extension. Striped cucumber beetles are yellow with a dark head and have three crisp dark lines on the forewings that extend all the way to the wing tip. Photo by Jim Jasinski, www.ipmimages.org. 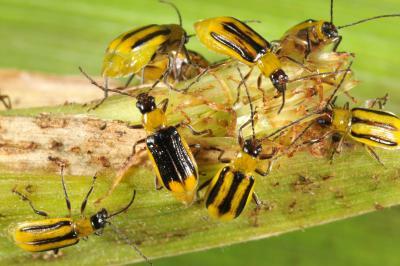 Spotted cucumber beetle (southern corn rootworm) are yellow with a dark head and have 11 black spots on the forewings. Photo by Jim Jasinski, www.ipmimages.org. 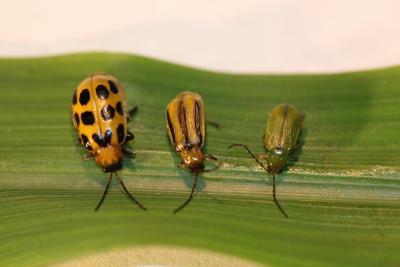 Left to right: southern corn rootworm (spotted cucumber beetle), western corn rootworm, and northern corn rootworm. Photo by Adam Varenhorst.